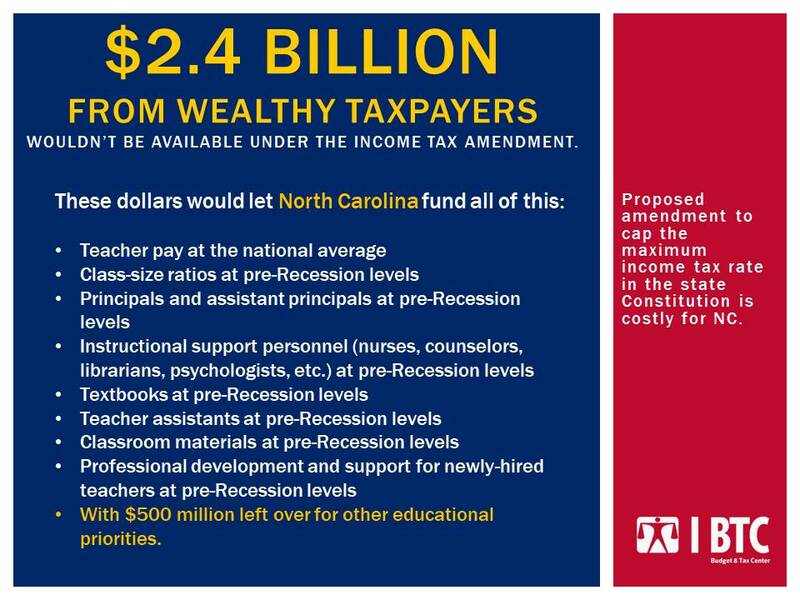 Imposing an arbitrary income tax rate cap in the North Carolina Constitution could fundamentally compromise our state’s ability to fund our schools, ensure the educational preparation of young children, and boost the educational attainment of our workforce. Such a cementing of a missed opportunity in education could happen as the tax load shifts even further onto middle- and low-income taxpayers, while the state’s highest income taxpayers, the top 1 percent, continue to benefit from recent tax changes since 2013. In the Budget & Tax Center’s report on the costs of a proposal to lower the maximum tax rate allowed on incomes, we find that by cutting off the potential for top brackets on high-income earners, North Carolina will not have $2.4 billion available to meet unmet needs. These needs are real in classrooms across the state and for families with children in every community. Per pupil spending remains below pre-Recession levels – 25 percent lower than South Carolina. The teacher pay penalty in N.C. is second worst in the nation, behind only Arizona. Students are learning in buildings with mold and leaking roofs. Students are lacking access to the tools that support their learning — technology and textbooks — and their well-being — school nurses, counselors and food. With $2.4 billion, North Carolina could address these needs and help every child reach their full potential. Failing to do so puts at risk our constitutional commitment to public education. Alexandra Sirota is the Director of the Budget & Tax Center, a project of the NC Justice Center.